How long is a piece of string! A bespoke service to frame artworks is subject to many variables: the type and size of artwork, your personal taste, choice of mount (single, double, etc. ), whether the mount needs a title window, any special requirements (such as sewing an artwork to a support), and not least the moulding chosen to make the frame. Mouldings vary hugely in price, ranging from simple basic mouldings up to large, ornate and expensive ones. As you can imagine, without seeing the object to be framed and consulting with you about framing choices, we can’t really answer the “What will it cost?” question. Despite that, before we've even seen the object to be framed, the question is frequently asked! Therefore we have provided below a guide to minimum framing prices for common types of art such as photos, paintings, needleworks and so on. It assumes they are being simply framed. Use the information in the table below to get an idea of the minimum cost of framing if you have one of the types of artwork listed. The prices are based on a simple inexpensive black or white frame (see note 1 below) and are inclusive of all hanging accessories. These are not ready made mass produced machine made frames. All are hand made exactly as you require. We always use a frame pricing program to determine exact and consistent prices, we don’t estimate. Whatever you have to frame we will be happy to meet you to discuss your requirements, to advise on framing choices and to provide an exact cost. There is no obligation to proceed. For directions to our studio please visit our contact page. 1. 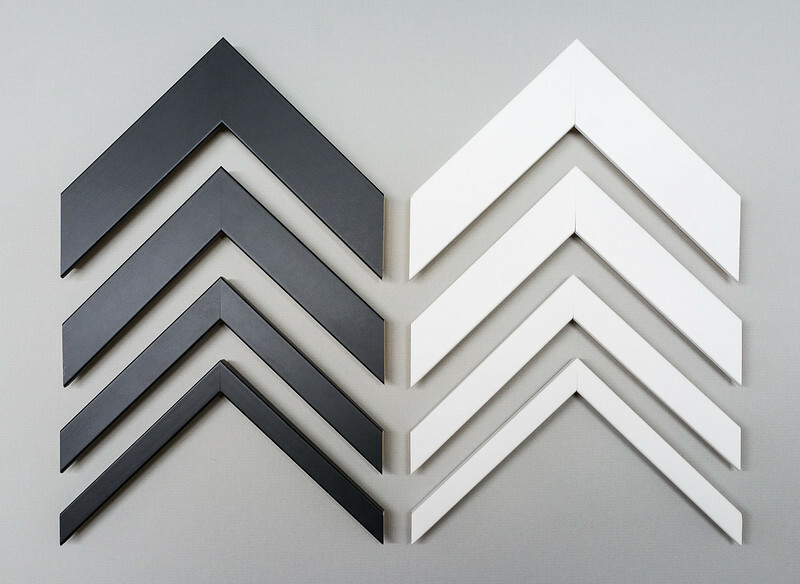 Frame Choice: A simple black or white frame may not be suitable for all types of artwork for technical or aesthetic reasons. See the range of minimum price frames that are available illustrated below. 2. Prices in this guide can change without notice although we endeavour to bring this page up to date as soon as possible. 3. Artwork Size: Measure your artwork and refer to the sizes in the table. Use the prices as guidelines if your artwork falls between two sizes. 4. Paper artwork includes photographs, original watercolours, acrylics, giclee prints, and limited edition prints. The price shown includes a single mount, glass and frame. If you don't want a mount deduct from the price shown the price listed under 'Extra Mount' column. 5. Needlework includes cross-stitches, tapestry, embroidery and other fabric-based art that may need to be stretched and/or sewn into the frame. The price shown includes a single mount, glass and frame. It does not include items of clothing, they need to be assessed on an individual basis. 6. Oil Paintings includes oils or other artworks that are on canvas and are already stretched onto stretcher bars or oil paintings on boards. Price includes a frame only. NB If you have canvas that needs to be put on stretcher bars before framing please contact us for advice and pricing. 7. Additional Mount: This shows the cost per additional mount for paper or needlework artwork types. 8. Student: If you are a student preparing work for a show we may be able to offer a reduced price providing you can do some of the frame assembly and/or mount cutting work yourself. Contact us for more information. 9. UV Glass: This shows the additional cost if you choose Anti-reflective UV blocking glass. For more information about this very special glass visit the page entitled The Glass. In order to achieve the minimum prices listed above we use the mouldings illustrated below. They are very simple wood mouldings from the Nielsen Bainbridge B3 range, available in black and white and in a variety of sizes to meet the needs of most framing jobs. Of the four sizes available we use the smallest size for artworks up to A3 in size. The next larger size up for A2 artworks, the next for A1 artworks, and finally the largest size for A0 artworks.